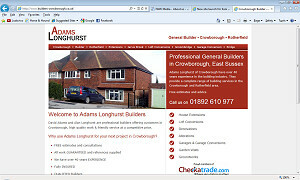 Crowborough builders, Adams Longhurst are now on Checkatrade (No. 282035). People use Checkatrade to find reliable and honest builders and tradesmen. All members of Checkatrade are vetted and verified before being accepted. Dave Adams and Alan Longhurst have over 40 years experience in the building industry between them. They cover Crowborough, East Grinstead, Tunbridge Wells, Edenbridge, Uckfield and Heathfield, offering a range of building services from building a garden wall to building house extensions.